'The Badminton Game' is one of several pictures painted by David Inshaw soon after he moved to Wiltshire. The images were inspired partly by his discovery of Thomas Hardy and he made a number of pictures using the garden as a theme. The art print captures a moment in time and a world of day dreams. The image is blessed by strong sun light in the clear, early morning air. 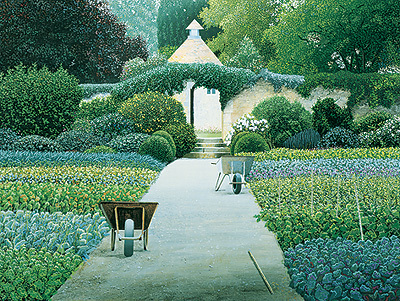 To see the range of David Inshaw art prints click on the image above. 'Bernard Showing Off' is a top selling Limited Edition Print from John Lines. It is very representative of the artist's print work. It contains humour and interest set against a back ground of a gritty British sky and urban location. The art print features a scene of boys playing in the back alley with Bernard standing triumphantly on high up in the tree. Closer viewing of the Limited Edition Print reveals much more detail. Bernard's gang are at the bottom of the tree trying to shake the saluting hero to the ground. Another boy is running to join in the fun and while all this activity is going on the washing gently hangs from the line. To see the range of John Lines limited edition prints click on the link above. The Richard Adams limited edition print 'Harvest Supper' is a wonderful example of the artist's prints. It is full of detail and activity. It seems the whole village is present at the harvest feast. Around the table there is much eating and merry making whilst musicians play and people dance. As with many of Richard Adams Limited Edition Prints there is exuberance and humour in the art print. His art work is reminiscent of the social commentaries of artists Hogarth and Brueghel. To see the range of Richard Adams limited edition prints click on the link above. Derek Jarman is well known know for his film work, but he is also remembered for his famous shingle cottage-garden. The garden was created in the latter years of his life, in the shadow of the Dungeness power station. The house was built in tarred timber. Raised wooden text on the side of the cottage is the first stanza and the last five lines of the last stanza of John Donne's poem, The Sun Rising. The cottage's beach garden was made using local materials and has been the subject of several books. In this top selling limited edition print Michael Kidd has created a strong enduring image. His trade mark detailing is evident in the art print and there is a real depth to the composition. The print has been produced using the finest techniques and materials. And, every print has been reviewed by Michael Kidd to ensure it is a faithful reproduction of the original painting. To see the range of Michael Kidd limited edition prints click on the link above. John Lines excels at producing limited edition prints of the urban British village or town life. He sees pictures in scenes that might otherwise be ignored or forgotten and creates art prints that records a side of peculiarly British life for posterity. He does this with warmth, humour and skill. In 'Morning Song' the start of a new day is witnessed by a small bird perched high in the tree and an audience of one. In this limited edition print John Lines has captured the beauty of the natural world against the British urban landscape complete with discarded washing machine and satellite dishes galore. As with all John Lines art prints it is the detail included that sets the scene and creates a narrative. Everything is portrayed honestly and without adornment and this adds to the sense of involvement with the narrative of the limited edition print. This top selling art print features the famous Raymond Blanc Michelin starred establishment in Oxfordshire. A the Le Manoir aux Quat'Saisons the cuisine is undoubtedly the focus of every guest's visit but there is increasing appreciation of the English manor house building and gardens. The quality of the food at Le Manoir stems from the freshness and purity of its ingredients. The two-acre kitchen garden produces 90 types of vegetable and over 70 varieties of herb. In this Limited Edition Print Michael Kidd has produced a powerful yet quiet image of the vegetable garden. There is an abundance of greenery and shapes and a hint of intrigue as the viewer's eye is encourage to imagine what is beyond the Cotswold stone archway. 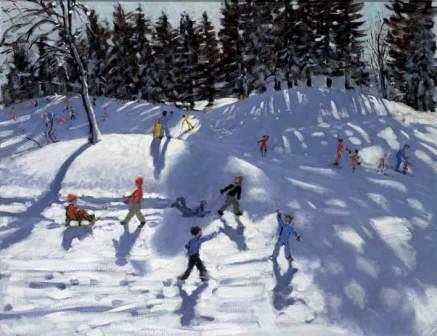 Andrew Macara snow scenes are highly sought after and 'Winter Fun' is one of the most valued by Red Rag customers. Macara is a master at capturing light and shade in his art prints. His distinctive style and treatment of light and shade are very evident in this limited edition print. Long blue-grey shadows cast by tall bare trees capture this snow scene perfectly. There is a sense of stillness and serenity in the background of the art print which contrasts with the bright colours and movement of children having a snowball fight and playing in the snow. To see the range of Andrew Macara limited edition prints click on the link above. Janet Ledger was born in 1934 and studied painting at the Northampton School of Art.Her work has been compared favourably with the paintings of L S Lowry and like Lowry, she creates misty industrial landscapes and paintings of people. Her limited edition prints have a marvelous feeling for atmosphere and colour combined with a strong sense of observation of life. Few subjects escape the gaze of Janet Ledger, whether it be on holiday or at work, children at play or at school, the washing on the line, a city skyline at night, or the corner shops and back streets populated by buses, dogs, lamp posts. Often humour and pathos in her paintings and prints evokes another dimension, often providing the viewer a momentary smile. Jo March was born in Cornwall in 1962. She graduated from Sheffield University before returning to the pull of Cornwall and a career as a self taught professional artist. The Cornish landscape and the people that Jo whilst growing up, has a strong influence on her choice of subject and how she depicts the landscape in her paintings. Inspiration for her limited edition prints is often drawn from the environment and the people of her childhood. To see the range of Jo March limited edition prints click on the link above. A graduate of the Glasgow School of Art, George Birrell is well known for his characteristic interpretations of the architecture of Scottish east coast harbour villages. His limited edition prints display both contrasting colours to emphasise line and pattern and monochromes for subtle interpretations of tone, depth and weather conditions. The art print 'East Coast Blues' is a fine example of George Birrell art work. It features the strong design, simplification, colour and bold composition which are hallmarks of his art prints. Birrell displays an emotional expression of feeling about the subject. To see the range of George Birrell limited edition prints click on the link above.